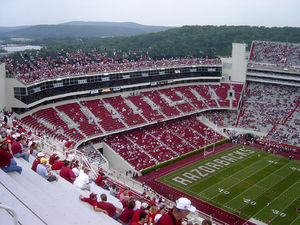 During the 2000-2001 renovations, Razorback Stadium increased the seating capacity from 50,019 to 72,000, with an option to expand capacity to 76,000 with the "temporary" bleacher seating atop the south end. Before 1938, the Razorbacks played in a 300-seat stadium built in 1901 on land on top of "The Hill", which is now occupied by Mullins Library and the Fine Arts Center (in the "center" of campus). 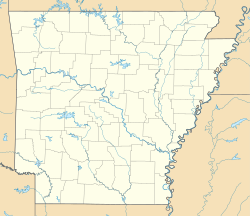 The new stadium cost approximately $492,000 and was funded by the Works Progress Administration, with the University of Arkansas only paying 22% of the contact. The stadium opened for the 1938 football season as University Stadium, holding a capacity of 13,500 spectators. In the home opener for the Razorbacks, the Razorbacks defeated Oklahoma A&M by a score of 27–7 on September 24, 1938. The following week, Arkansas dedicated the stadium to then sitting Arkansas Governor Carl E. Bailey on October 3, 1938, changing the name of the stadium to Bailey Stadium. Following Governor Bailey's defeat in the 1940 gubernatorial election to Homer Martin Adkins, the stadium's name was changed in 1941 to Razorback Stadium. Athletic director Frank Broyles began searching for architects for the proposed $65 million stadium expansion and renovation in 1998, believing that the renovation was needed in order for the Razorbacks to compete in the Southeastern Conference at a consistent level. Broyles hoped for a completion date of 2000 or 2001 and narrowed the search down to three architecture firms: Eisenman Architects of New York, Heery International of Atlanta and Rosser International of Atlanta. Broyles awarded the renovation contract to Heery International with local support from the Wittenberg, DeLoney and Davidson architecture firm of Fayetteville. The renovation was partly funded by the Donald W. Reynolds Foundation, when the foundation donated $21 million in 1999 to help renovate the stadium. What was then the largest LED display in a sports venue, the 30 by 107 foot screen produced by SmartVision was installed along with a new scoreboard at the northern end zone in 2000. The expansion was completed before the beginning of the 2001 football season, increasing the permanent seating capacity to 72,000 from its previous capacity of 51,000 seats. 4,000 bleacher seats were added in the south end zone upper deck bringing capacity to just over 76,000 with the new expansion. In honor of the Reynolds Foundation's generosity, the stadium was formally renamed Donald W. Reynolds Razorback Stadium on September 8, 2001, where Arkansas lost to Tennessee by a score of 13–3. On November 3, 2007, the date of the last Fayetteville home game of the 2007 football season, the playing field was dedicated and named in honor of outgoing athletic director Broyles. A major renovation to the stadium was proposed in 2011 by Athletic Director Jeff Long, unveiling the plans to enclose the north end zone. The proposed renovation is estimated at $78 million to $95 million, which would feature at least 5,000 new seats, including field-level suites and indoor and outdoor club areas. A new upgrade to the stadium for the 2012 season increased the size to 38 by 167 feet, from the previous LED screen size of 30 by 107 feet. The upgrade was contracted through LSI Industries. During the 2016–17 offseason, the Broyles Athletic Center was demolished as part of a $160 million renovation and expansion of the stadium. The expansion will add 4,800 seats and new premium seating to the north end zone. [not in citation given] This expansion will boost the capacity of the stadium from 76,000 (with south end zone top bleachers) to 80,800. However, since bleachers are no longer being used on the roof of the south end zone, official capacity beginning with the 2018 season, as relayed to the university's board of trustees prior to its vote to approve the expansion project, will be 76,212. The increase in capacity is fewer than 4,800 seats because some club seating on the east side was eliminated to add additional suites. Since 1948, home games were divided between two venues: Razorback Stadium and War Memorial Stadium in Little Rock. Because of the stadium renovations in 1999-2000, Razorbacks athletic director Frank Broyles wanted to move all home games to Razorback Stadium to help pay off the $30 million bond. Broyles pointed out that the expanded Razorback Stadium would increase revenue to $3 million per game, compared to the $2 million per game for playing at War Memorial Stadium. However, Little Rock investors did not like the idea of moving all home games to Fayetteville and countered with an offer to renovate and expand War Memorial Stadium to increase revenue. Also, Little Rock investor Warren Stephens threatened to discontinue his family's support ($150,000 in annual donations with an additional $1 million in annual support from his family's company Stephens Inc.) for the program if games were pulled from Little Rock. After listening to both Chuck Neinas (Broyles' consultant on the issue) and Stephens in January 2000, the University of Arkansas Board of Trustees voted 9-1 to sign a compromised contract with the owners of War Memorial Stadium. The contract would keep at least two Razorbacks games, with one being a conference game, in Little Rock until the end of the 2014 season. In 2008, the contract with War Memorial Stadium was extended through the 2016 football season by athletic director Jeff Long. In 2014, a five-year contract called for one game to be played at War Memorial Stadium each season through 2018. In 2014 and 2018, the game was a conference opponent. In 2015, 2016, and 2017 the game was a non-conference team. 2018 marked the 75th anniversary of the Razorbacks playing in War Memorial Stadium. In 2018, another agreement was signed to play games in War Memorial Stadium through 2024. ^ Glier, Ray (September 26, 2010). "Sloppy but Strong, Alabama Rallies". The New York Times. Associated Press. Retrieved December 29, 2010. ^ "Arkansas selects turf for Razorback Stadium". University of Arkansas Athletic Media Relations. June 2, 2009. Retrieved June 29, 2018. ^ "Baylor Field Goal Beats Arkansas, 9-6; Nelson's Placement Decides in Last Thirty Seconds". The New York Times. October 9, 1938. ^ "2003 University of Arkansas Facilities Management Planning Group". University of Arkansas. 2003. Retrieved August 23, 2012. ^ "Ticket Office Information". arkansasrazorbacks.com. 24 January 2015. Retrieved 9 April 2018. ^ "350 North Razorback Road, Fayetteville, AR 72701, Google street view and map". allcountries.org/streetview. Retrieved 2017-12-30. ^ "Arkansas names football field after outgoing athletic director Frank Broyles". Associated Press. SportingNews. November 4, 2007. Retrieved December 29, 2010. ^ "1999 Schedules/1998 Results" (PDF). NCAA. Retrieved September 4, 2012. ^ "New stadiums: Old Gray Lady and others". StadiumDB.com. September 25, 2015. Retrieved September 25, 2015. ^ Martin, Michael S. (2002). Chemical Engineering at the University of Arkansas: A Centennial History, 1902-2002. Fayetteville: University of Arkansas Press. ISBN 0-9713470-0-X. ^ a b "Firms line up for UA stadium project. (Razorback Stadium in Arkansas)". Arkansas Business. Entrepreneur. October 12, 1998. Retrieved December 29, 2010. ^ a b "Best And Worst Of 1998". Arkansas Business. Arkansas Business. September 28, 1998. ^ Thompson, T.T. Tyler (2004). The University of Arkansas Razorback Band: A History, 1874-2004. Fayetteville: University of Arkansas Press. p. 57. ISBN 1-55728-779-1. ^ a b c Schroeder, George (2005). Hogs! The Story of Razorbacks Football. New York: Simon & Schuster. p. 207. ISBN 0-7432-8052-0. 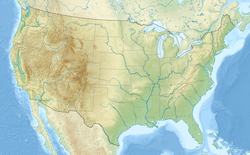 ^ Allen, Nate (August 5, 1999). "Razorback Stadium going uptown". Log Cabin. Retrieved December 29, 2010. ^ "$10 Million Grant From Donald W. Reynolds Foundation Brings New Life to Vol Walker Hall". University of Arkansas Relations. May 13, 2010. ^ "McFadden rushes for SEC-record 323 yards as Arkansas rolls". Associated Press. ESPN. November 3, 2007. Retrieved December 29, 2010. ^ "Arkansas unveils athletic facilities plan". Associated Press. ESPN. October 18, 2011. Retrieved April 26, 2012. ^ Kuhlenschmidt, Jack (October 28, 2010). "Stadium Preview: Donald W. Reynolds Razorback Stadium". The Vanderbilt Hustler. InsideVandy. Retrieved December 29, 2010. ^ "New Video Display for Razorback Stadium". Athletic Media Relations. ArkansasRazorbacks.com. May 21, 2012. Retrieved August 25, 2012. ^ "Donald W. Reynolds Razorback Stadium Renovation". Arkansas Razorbacks Athletics. Retrieved 2 May 2017. ^ "Donald W. Reynolds Razorback Stadium -- Trustee Questions". Arkansas Razorbacks Athletics. Retrieved 29 July 2018. ^ "Broyles' Power: Fierce or Fading?". Arkansas Business Publishing Group. Entrepreneur. July 24, 2000. Retrieved December 29, 2010. ^ Schroeder, George (2005). Hogs! The Story of Razorbacks Football. New York: Simon & Schuster. p. 208. ISBN 0-7432-8052-0. ^ "Razorbacks sign two-year War Memorial Extension". August 23, 2008. Retrieved November 25, 2010. ^ "Razorbacks Reach Agreement To Continue Games At War Memorial Stadium". May 17, 2018. Retrieved February 2, 2019.